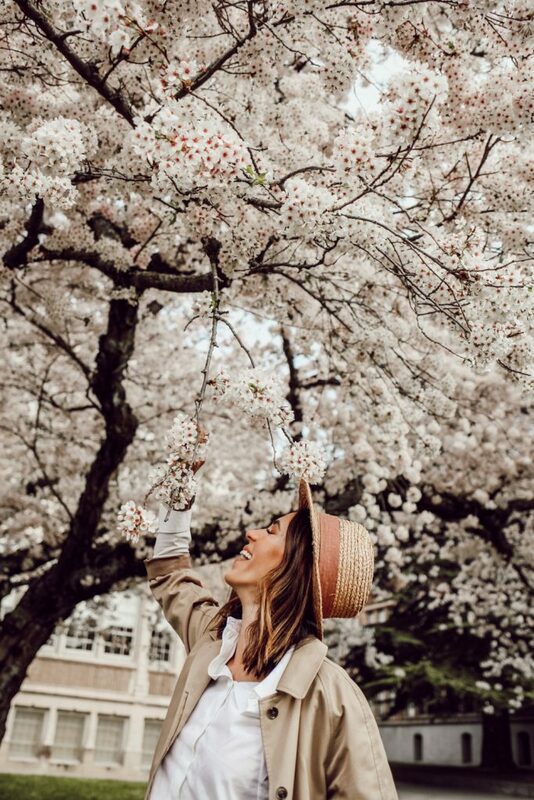 Spring is in full swing in Seattle and last week I went to the University of Washington with my girl Cortney (from The Grey Edit) to take in the beauty of the cherry blossoms! It’s strange to finally live in a city where spring comes on time – in Chicago, sometimes it would never come! 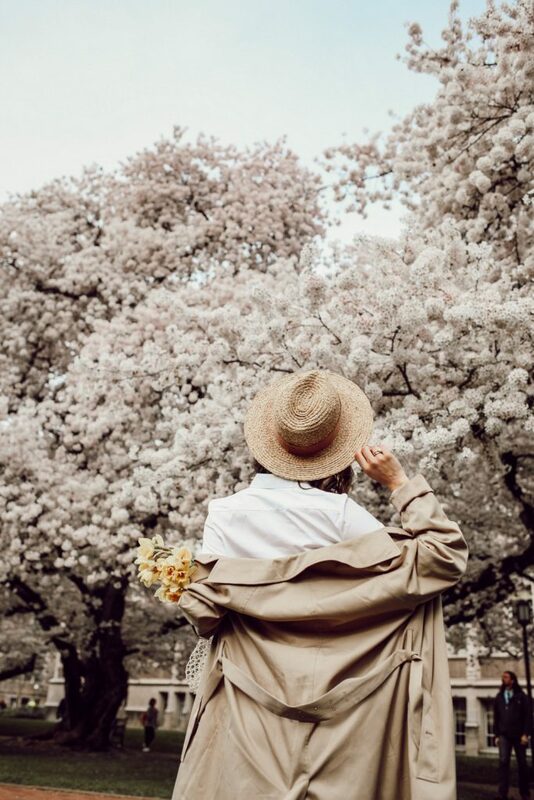 Seeing the cherry blossoms in full bloom was truly magical, and you bet we were equipped with our cameras! Planning for this trip, I really wanted to find pieces that embodied spring! 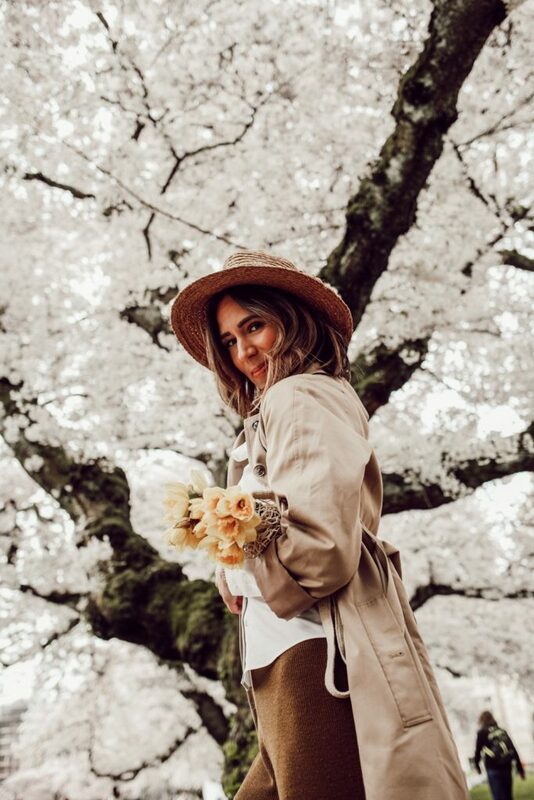 When putting this look together, it was all about tying in all the important spring essentials and sharing how you can incorporate them in to your every day! And any item from Shopbop in this post is currently on sale, like these mules. Use code EVENT19 for 20% off your order under $500 and 25% off order over $500! Transitional fashion is all about those pieces that are going to take your winter wardrobe right in to your spring wardrobe. Were are still in this weird period between seasons, where it’s not time to overhaul everything just yet, but you can start with certain pieces here and there. Once of the first things I shed is my outerwear – there is nothing more liberating than transitioning out all your heavy winter outerwear! Trench coats are the easiest way to make that transition! Stay tuned for tomorrow’s post on the Shopbop Sale! I’m compiling all of my favorites from the sale, including spring essentials that are worth the splurge! Use code EVENT19 for 20% off your order under $500 and 25% off order over $500!